Free-form! We like free-form lasagna. Don’t argue with me. 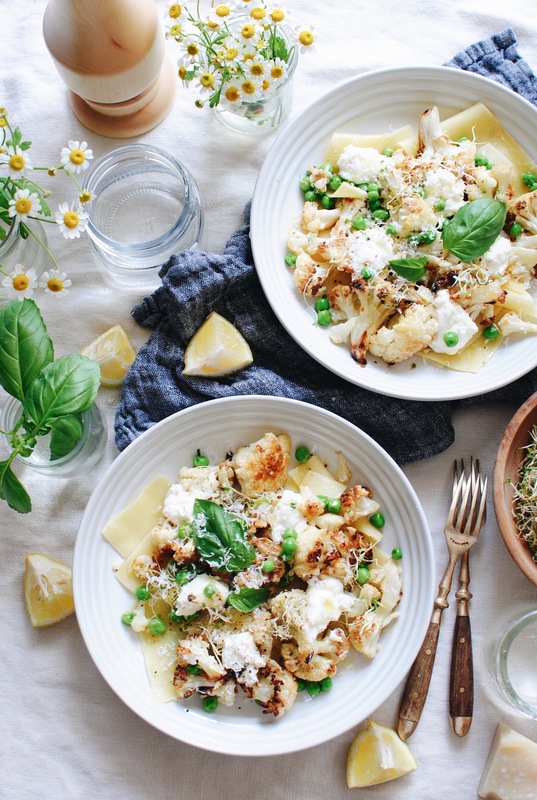 This is one of those springy-summery meals that’s super comforting, but doesn’t feel like you ate a wet cinder block. It’s also vegetarian, but you can absolutely throw in some shredded rotis if your hearts cries. Super simple sitch here, ma’ams. 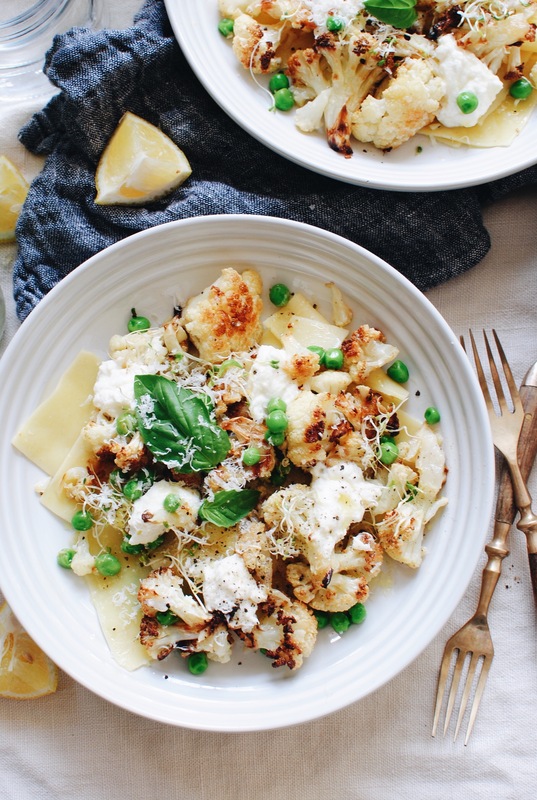 We roast a head of cauliflower. And you know my rule, a FULL HOUR. Give it an entire hour in that hot hot hot oven! Not a minute less. One whole hour. You want color. You want depth. You want charring and flavor and tenderness and lusciousness. So since this is a free-form lasagna, the ricotta is going to be dollop nation station. You’ll add some fresh lemon juice to it, a good pinch of salt and pepper, and that’s AWL. I mean all. And it doesn’t have to stay cold. Room temp is fine, once you whisk it all together. 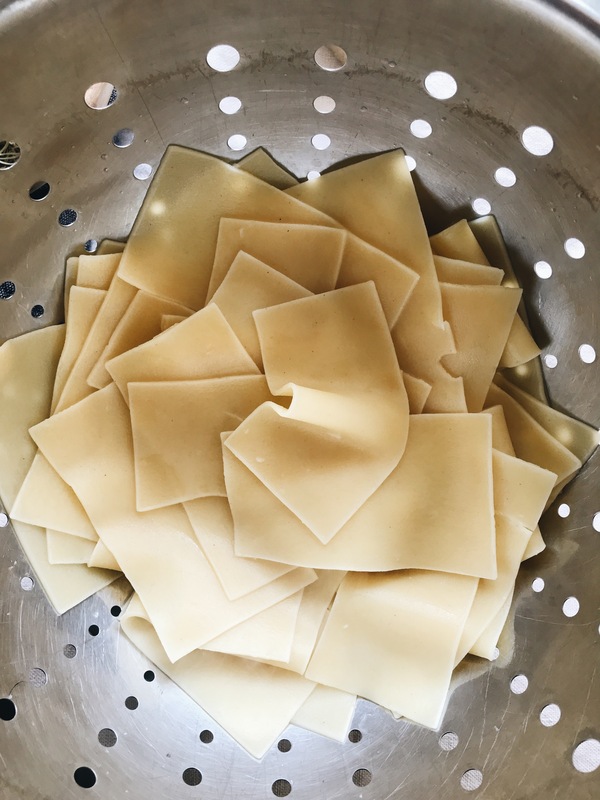 Okay, these were those flat, fancy no-boil lasagna sheet from Trader Joe’s, but I obviously had to boil them. Since it’s free form. You know. 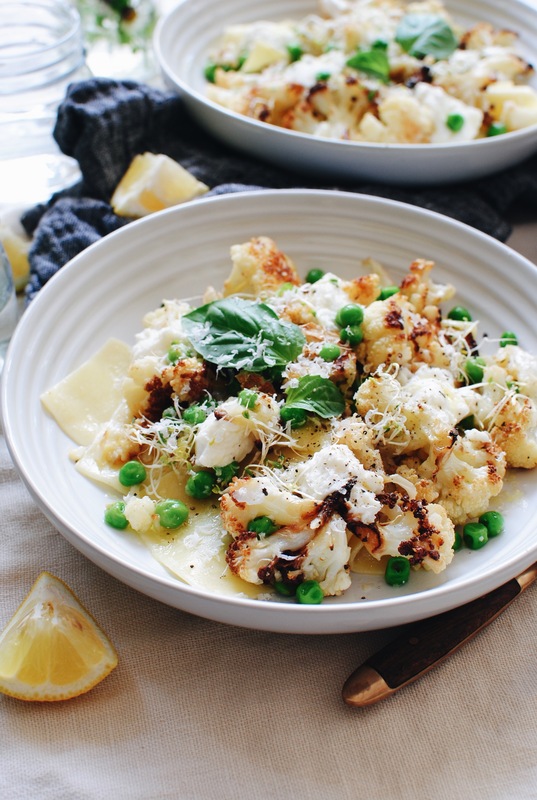 A few lasagna sheets, a drizzle of oil, some roasted cauli, a few (thawed) peas, dollops of lemony ricotta, just get all willy nilly with it. 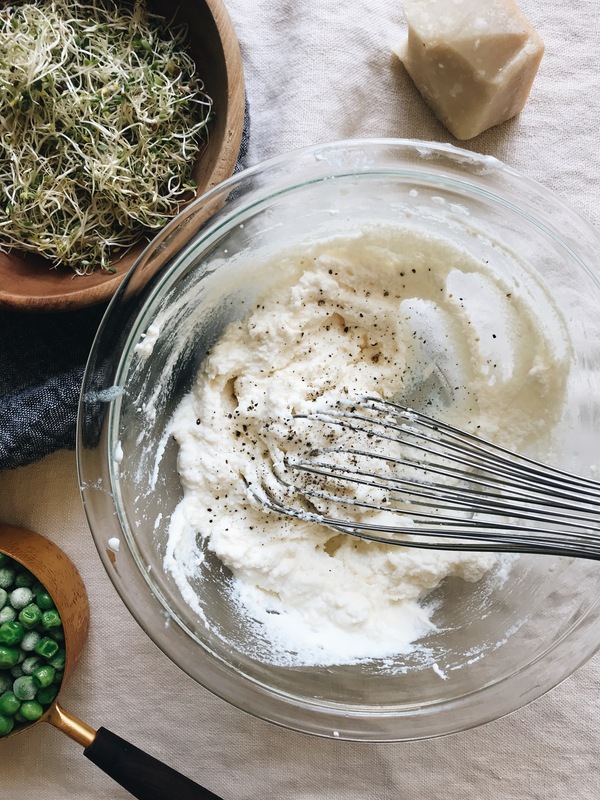 Also – if you need to drizzle a few baby drops of the starchy water over everything, juuuuust to give it the slightest hint of a sauce, go for it! The ricotta will soften into it, and it will become this light, lemony glossiness. You’ll barely be able to handle it. And one more drizzle of olive oil and a good grind of black pepper and your entire upper torso. Summer = free form. So. 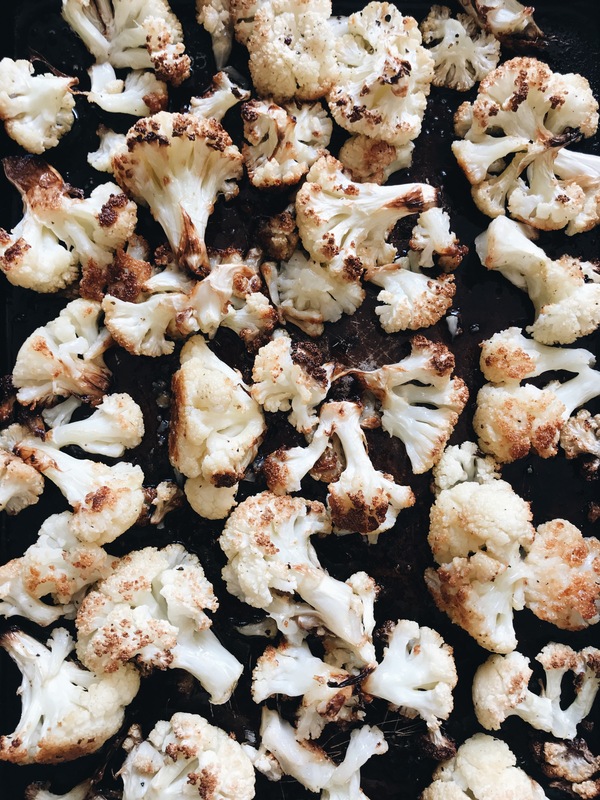 Arrange the cauliflower florets on a baking sheet, and drizzle with a Tbs or so of extra-virgin olive oil. Season well with salt and pepper, and roast for an hour. In the meantime, place the ricotta cheese in a medium mixing bowl, and whisk in 2 Tbs. fresh lemon juice, a pinch of salt and pepper. 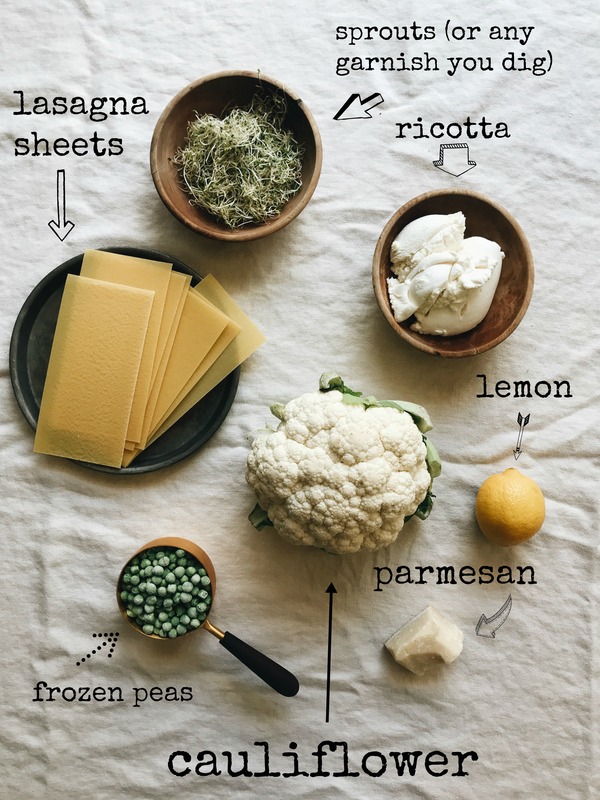 Bring a large pot of salted water to a boil, and cook the broken lasagna sheets when there’s about 10 minutes left on the cauliflower. You’ll want to assemble immediately after, so that the sheets don’t get sticky. Save about half a cup of starchy water, for drizzling if needed. Drain the lasagna sheets, and start layering in wide shallow bowls. 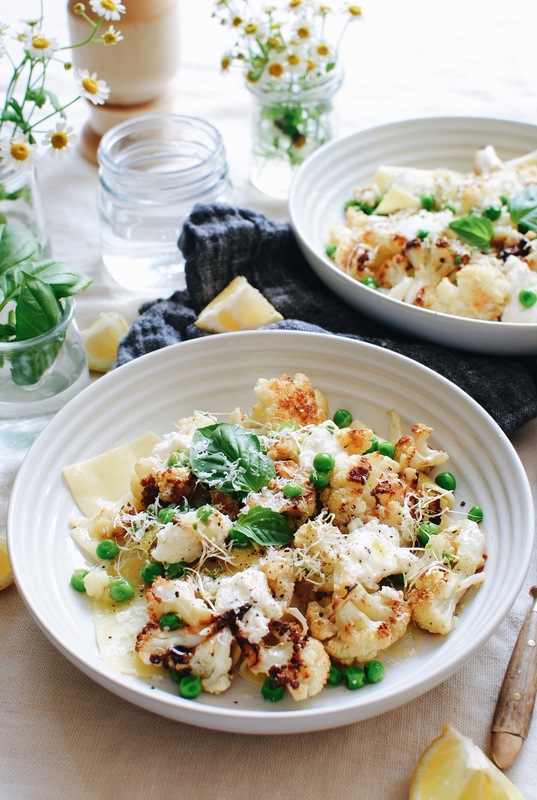 A few broken sheets, some roasted cauliflower, a few dollops of lemony ricotta, maybe a drop or two of the starchy water, a sprinkling of peas, followed by plenty of fresh parmesan and garnish! Give it another pinch of finishing salt, a few more squeezes of fresh lemon juice, and a grind of black pepper, and you’re set for life. Okay, thank you! You've made my day. Only one other person has ever commented on it, so I've always wondered if it was worth it. :) So THANK YOU. I completely agree with Rebekah!! Best post ever and keep the graphics! I look for it every time! I look forward to the graphic for every recipe! This looks so yummy and light. I love lasagna but the traditional type is definitely heavy for summer. I need this in my mouth! That dish looks very attractive.I will do it for my dinner! 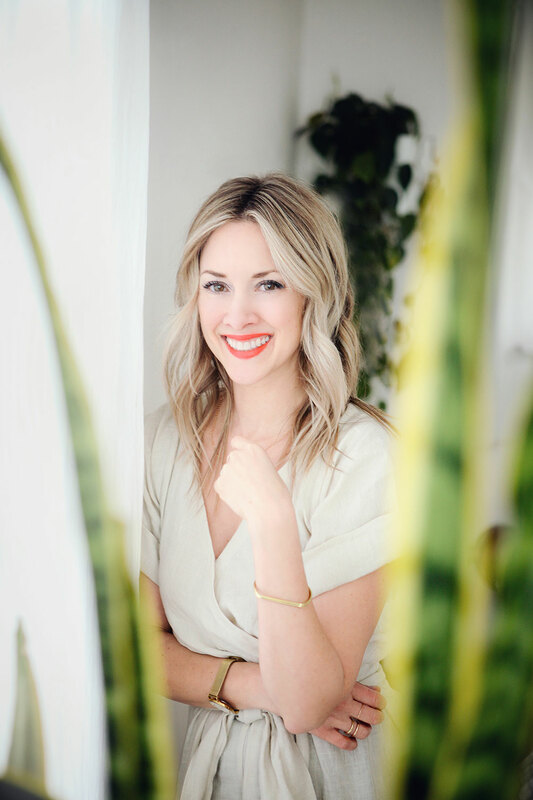 Love the graphics and your photography! In winters I and my whole family eat Cauliflower. It is very good for health. This recipe looks so yummy and delicious.